Have you ever felt that your lower back was stiff or achy? What about downright painful? Do you have lower back pain when you stand or walk or sit for a long period of time? Is lifting things a problem? You don’t have to just deal with it. Along with doing things like losing weight if that is exacerbating the problem, or taking over the counter pain medications, there are treatments that can help you feel better. Physical therapy is one of them. Whether it’s a strained muscle lumbar stenosis, facet joint disorders, degenerative disc disease, sciatica, or other issues, they can take that information and how your pain is restricting your movement and figure out the best treatment for you. They will sit down with you and ask tons of questions that are designed to help them understand which treatment will work best for you. Treatment can involve a plethora of things, but generally will include soft tissue mobilization, trigger point dry needling, joint mobilization and manipulation, stretching, and strengthening exercises. What all of these things do is improve strength and ease restrictions. That in turn will increase mobility and decrease pain. Your physical therapist will also give you exercises to do at home. These will help you improve during therapy. Doing them after therapy has ended will keep that problem from worsening or coming back. Don’t live with lower back pain. Seek help and live a better life without pain. 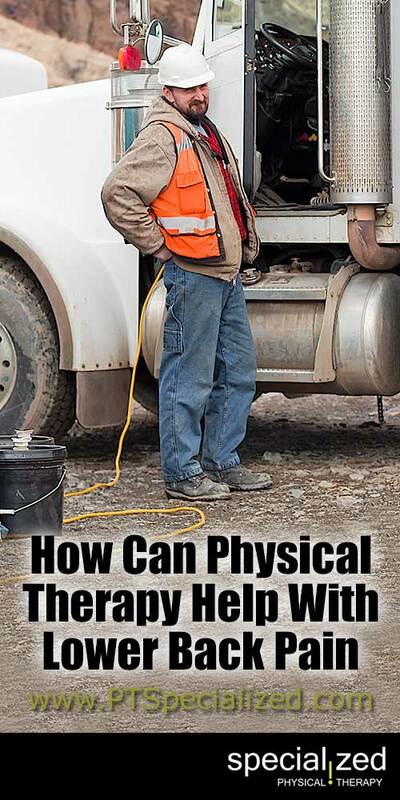 Physical therapy can, and does, help. Talk to your physical therapist about treatment today. Find out if we can help you, sign up for a free pain consultation today!